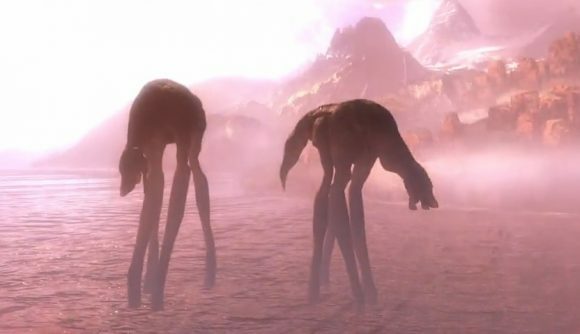 You know those long-legged behemoths standing in the water outside Apex Legends’ island? Well, tragically, they aren’t real – they’re illusions, tricks of the eye, lies. A persistent player was able to launch himself directly at one of the beasts, and found that he flew right through its scaly flanks. Reddit user theplake used a weird trick in Apex Legends to launch himself like a human cannonball at the creatures. The basic idea is to open a supply crate, then melee attack the open lid several times. When you hop on top, it’ll send you flying across the map in the direction you had been attacking (and putting a jump pad down first seems to increase the effect). With some careful setup and aiming, theplake managed to fire himself right at a pair of the creatures as the circle closed. It was a perfect shot, even though his line of sight was blocked by a rock formation. As he soared through the air, he must have felt like the first monkey shot into space. This was, after all, for science. He posted the results to the Apex Legends subreddit. Of course, since Apex Legends is a videogame, it makes sense that the beasts don’t have collision detection – they’re meant to be part of the background, not a game element you interact with. But one commenter has an alternate theory: The creature theplake flew through was simply the Mirage clone version.